Large-scale outdoor installations and fully immersive events. We light all kinds of awesome events and experiences in the outdoors. 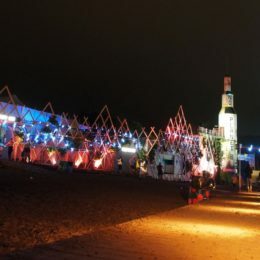 From full-on festival dance venues to chill-out areas and interactive designs. We use light to transform landscapes and create stunning immersive spaces. Along with art directors and producers, we build installations that bring outdoor events to life. Big lighting installations that redefine your event space, attracting crowds and sending out your message. Lighting design and installation for large outdoor spaces, keeping your whole crowd immersed in your event. Capable of working to a tight budget and practical constraints, making your money fo further towards making your event amazing. We started our outdoor lighting adventure working at Glastonbury Festival’s Greenpeace Field in 2009. Back then it was only a daytime venue. We took over lighting the entire field as lighting directors in 2013. In the following five years we formed a super tight core crew, ultimately exceeding all targets for footfall, signups, donations. The field has transformed from a daytime field into a rip-roaring outdoor party venue in 2017. 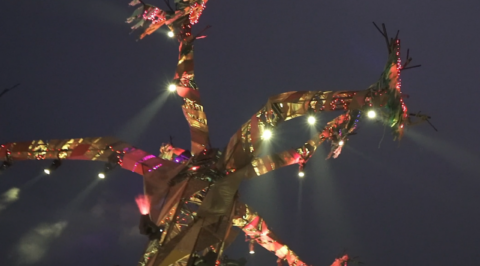 Complete with an 18m tall ‘rave tree’, a big ambitious centrepiece for the field, which we delighted in lighting. Large installation pieces like these can really send a message to a crowd, as well as creating an amazing atmosphere. So the word went out, ‘Let there be light,’ and up stepped Bailes and Light to deliver a stunning piece of work. Working to a very tight budget and schedule the illuminated tree fulfilled its mission and attracted thousands of revellers every night and bathed them with an ever changed symphony of lighting and effects. 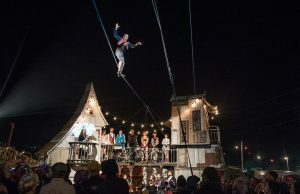 And we’ve lit more intimate outdoor events, like Fire In The Mountain – a 2,000 person capped festival in Wales. FITM began in 2014, when we worked with acclaimed lighting artist Jony Easterby. The following year Jony took a step back, so we took over the lighting design and production for the entire festival. The festival may be small. But creating a lighting set up that unites all the elements of the festival into one cohesive design is a big project. Especially while respecting the environment of the festival, and its activities and performances. 2014 was also the first year we lit Caravanserai at Camp Bestival. Caravanserai is right up our street. The set is sculptural and beautiful – starting from such a strong position makes it a pleasure to light. Collaborating with artists to build installations with an impact is why we do what we do. Whether you need a single striking installation, or a fully immersive space – we can help you with any challenge your event might throw at you. 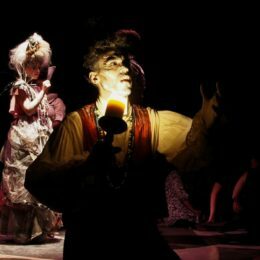 For the last few years Bailes and Light have taken on doing all the site, stage and artistic lighting for Fire in the Mountain. They continue to amaze and surprise – producing beautiful lighting arrangements, far from just functional. They are true artists! Copyright © 2016-2018 Bailes and Light Ltd. Registered in England No. 9969027. VAT no. GB 237 5655 83.